It's easy to look at deck building (or squad building, as I've come to refer to it in this game) as a tedious task, but sometimes it can be a lot of fun. It's all about the approach. Today, we'll go through the process, deciding on a win condition and building a deck around that. How will you win? This is the question that needs a definite answer and where your deck must begin. If you don't know how you'll win, how you'll chip away at life, then you don't have a working team. So let's start with a card that's really good but underplayed. I'm going to take Beast: Genetic Expert. This guy is a bruiser, though under-appreciated due to the quality of Mutate 666. He's the best Tsarina-counter in the game and if you play your game well, can get in a healthy amount of damage. Finally, we want the ability to get Beast in a blocking state as frequently as possible, so let's be certain that we have Mr. Fantastic or Phoenix. Mr. F is commonly used for this purpose, but I'm intrigued by Phoenix "Redd" - I can see that as a die that I'd purchase if the game goes long for some reason, whereas I would never buy Mr. Fantastic. We don't have "Mutate 666" so we need something that help us with the prep area and a little extra drawing when we need it. I feel safe going with Silver Surfer here. Beast will give us some life, so we're likely to get back some of what we spend when we surf for a die. Another tool that I'd like to include is the means to damage Beast during the attack step, ensuring thathe'll be KO'd while in a blocking state even if my opponent tries some funny business when distributing damage (still a grey area). 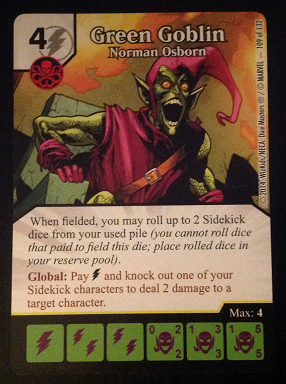 For that reason, I will add Green Goblin: "Norman Osborne" to the mix. I've already discussed how he can operate similarly to Surfer; but I'm likely to buy and field this one so that I can get more energy and sidekicks, so that I can KO more sidekicks and/or Beasts, so that I can get more dice in my prep area. His global is a strong tool for this squad, and his character ability offers support as well. Not to mention his bolts. While we're damaging characters, let's get a little more flexibility. Beasts will be rolling in and out quite a lot, and Sidekicks might as well, so how about Human Torch: "Flame On!" Why not Johnny Storm? Because of the flexibility that "Flame On" gives me. Here, I have the option to damage who I want to damage instead of being forced to hit a player and a character. The global is also exceedingly useful, and with enough bolts it can be a force. Further, we don't yet know if the global must be used against the same character; the card would indicate that it doesn't. Therefore, assuming level one Beasts, we could be knocking out multiple blocking Beasts even if we don't have the sidekicks fielded to pay for multiple uses. 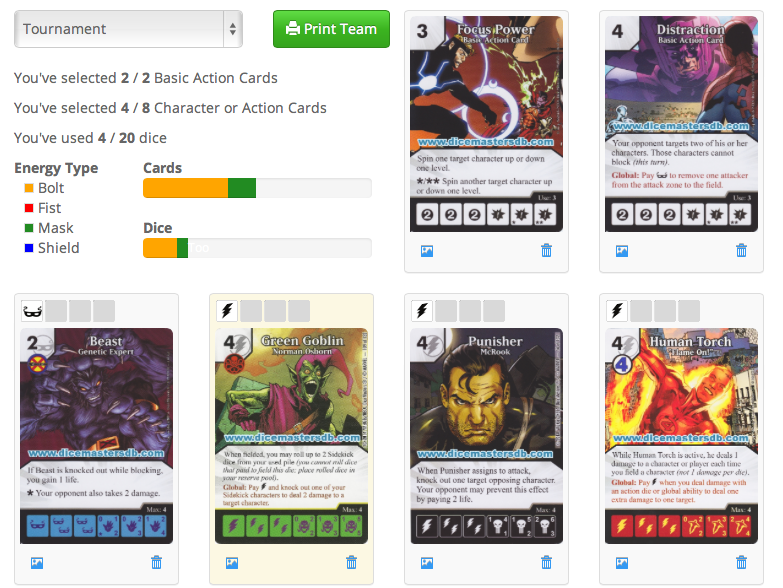 Sidekick-heavy strategies are rampant, and if I'm faced with one, I need an answer. Luckily, we have the trusty Storm: Wind Rider at our disposal, and I'll include her in this squad. I also like to have control elements throughout my decks, and that means that I would consider having Distraction present here as my second basic action.It'll give me the chance to keep the Beasts back if my opponent forces them to attack. I feel that I musthave an assassin; I was torn between Punisher: "McRook" and Hawkeye, but I'm going with McRook. Both are the same purchase cost, both offer bolts, but Punisher will have an ill effect, guaranteed, and Hawkeye doesn't necessarily offer that. Finally, if I'm using this many bolts, I might need to swallow a bitter pill in the form of Ghost Rider (shudder): "Johnny Blaze." I've talked before about how much I don't like this one, and if he comes up with a character face I would likely not field him. Bolts mean so much to this deck, though, that he may well be worth it. The upcoming Iceman that Katie talked about the other day will be very tempting to add to this later on, considering the synergy he has with bolts. But we'll have to dream for now. So how are we going to play this? What fixes does it need (probably LOTS!)? We'll pick this up in the future and examine what works, what we'll change, and how we might shrink a deck like this down for use in hybrid constructed! Stay tuned.